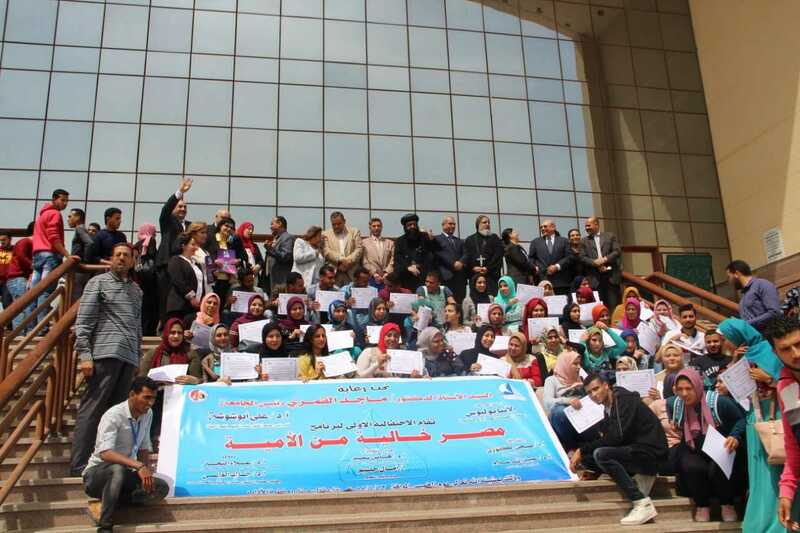 Seminar on "Egypt Free of Illiteracy"
The Faculty of Arts organized a seminar on: "Egypt Free of Illiteracy" in the presence of HE Julius, Bishop of Public and Social Services, Vice-Presidents of the University and the Egyptian Adult Education Project officials. Prof. Elkemary, President of the University, stressed the importance of seeking knowledge and participating in the project of literacy. He stated that science is the basis of the progress of human societies, explaining that illiteracy does not mean that of reading, writing and arithmetic, but it means the illiteracy of behaviors and manners. He explained that every student in the Faculty of Education and Arts is responsible for eradicating the illiteracy of 8 individuals. He said that there should be interaction and integration with the local community to create new opportunities and provide social services by contributing to the literacy project to make Kafrelsheikh free of illiteracy. Julius expressed his great pleasure to visit Kafrelsheikh University, pointing out that the symposium deals with solving an important problem, that of illiteracy. Therefore, it is important that university students exert great efforts to put an end to this serious problem. He stated that the youth are the infrastructure of society. All the members of the education project were honored by the church and the university. The students who participated in the training courses were honored and given certificates of appreciation due to the role they played in spreading science and culture to encourage others to become literate, which helps make our country free of illiteracy.